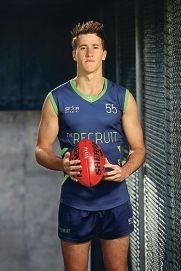 Reece Maxwell in team uniform for The Recruit. Two weeks ago on popular pay-TV football show The Recruit, it was Joondalup Wolves basketballer Reece Maxwell who provided the episode’s key emotional moment. Maxwell’s commitment had come into question after he took time off from the Michael Voss-coached contest, which offers the winner an AFL rookie contract, to attend the wedding of former teammate and Perth Wildcats player Greg Hire. The Edgewater 24-year-old was reduced to tears on camera when the show’s sports psychologist Leigh Russell quizzed him on the decision in a segment called Rate Your Mate. Despite the scrutiny, Maxwell went on to survive the ‘delisting’ at the end of the episode, eventually making the top five, but falling short of the final three who will this week learn who wins an AFL contract. Reflecting on his emotional moment in the series, the versatile athlete thought editors played it up ‘a little bit’ in the final cut, but considered it a fair representation.